Brad and I met at Green Drinks, a networking group for environmental professionals. We both graduated from ASU’s School of Sustainability but never met during our undergraduate studies. Now, we are both sustainability professionals; I work for the Decision Center for a Desert City as the education and community outreach coordinator and Brad works for the Arizona Department of Environmental Quality as a hazardous waste compliance officer. We wanted to practice what we preach, teach and enforce while making a green statement by having an Earth Month wedding. So we pledged to have as little impact on the environment as possible within our budget, which ended up actually saving us a bunch of green. Our wedding was Arizona-themed, highlighting our love for our local environment. 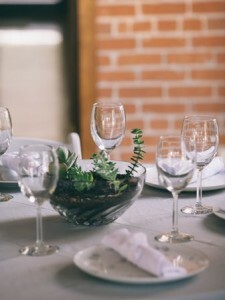 Cacti and succulents adorned the venue, in the bouquets, boutonnieres and glassware centerpieces. Our custom-made wedding bands featured malachite and desert ironwood inlay – both found in the Sonoran Desert where we found each other. Our bridal party reflected the theme as well. 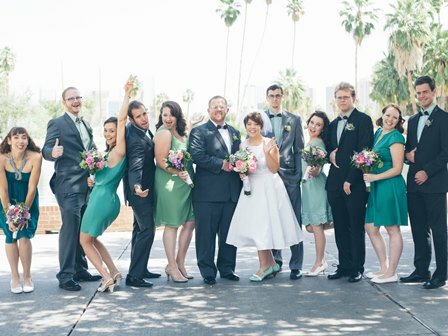 The bridesmaids wore dresses of varying shades of green to mimic the malachite, and which they picked out themselves to ensure repeat wear. The groomsmen sported green shirts, along with wooden bowties to correlate with the desert ironwood. We also had a wedding cactus-planting ceremony, which we jokingly call an age-old Arizona tradition. Both the wedding and ceremony took place at the Encanto Park Clubhouse in downtown Phoenix, only a few miles from where we live. Encanto was deemed a public park in 1934, and the clubhouse dates back to around that time, which gives the venue and surrounding neighborhood a vintage charm. The wedding had about 100 guests, including the bridal party and a live band. Since we live in a small apartment, we rented a house from Airbnb right in the Encanto neighborhood. It served as our “wedding headquarters” where out-of-town guests stayed, last-minute crafting was accomplished and all of the stuff we had been storing was relocated so we wouldn’t need to haul everything as far. And boy did we have a lot of stuff! We wanted to have a zero waste wedding, so our dishes were not only reusable but reused from other weddings. We accomplished this by scouring Craigslist for months, purchasing all of the plates, silverware, champagne flutes, water glasses, napkins and tablecloths we could find from people getting rid of their wedding stuff. We, in turn, sold it all a few weeks after our wedding. The glassware for our succulent-centric centerpieces came from Goodwill and other thrift shops in the area, and guests were invited to take them home afterward. We were determined not to buy anything from a big-box retailer and wanted to work directly with artisans – local ones when possible. This ensured that things like my wedding dress were not made by children in a sweatshop somewhere in the developing world. 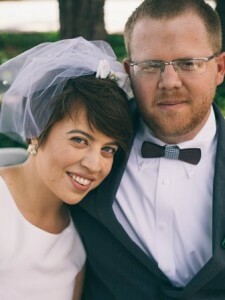 My dress, my veil, our rings, our invitations and the bowties came from Etsy – a fabulous experience because everything was customizable and required only a quick message through the app directly to the maker. 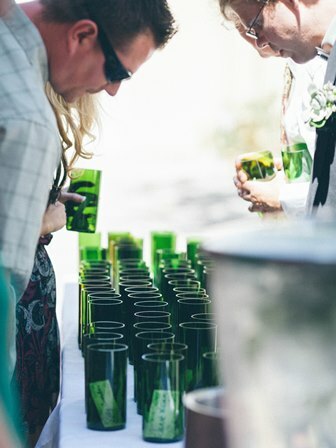 We worked with a local artist from the downtown Phoenix farmer’s market to make the main drinking glassware out of empty wine bottles that matched our color scheme. The farmer’s market was also where I found the artisans who created the malachite earrings for my bridesmaids and two gallons of cold-brewed coffee for the reception. Along with the cold brew, we served mimosas, sangria, iced tea and home-brewed beer whose ingredients came from the locally-owned Brewer’s Connection in Tempe. To sweeten the deal even further, my father brought local (for him) maple syrup from Vermont. Fellow School of Sustainability grad Andrew Lane helped us cinch our zero waste goal by picking up the food scraps – which Mark also composts in his kitchen – and the paper towels from the bathroom. He hauled them away in his electric car, along with the recycling, and reported later that his chickens enjoyed munching on the leftovers. The School of Sustainability’s home, the Julie Ann Wrigley Global Institute of Sustainability, was prominently represented throughout the day with alumni in the bridal party, former events coordinator Lesley Forst as the officiant, Walton Sustainability Solutions Initiatives managers Kelly Saunders and Alma Douglas helping with day-of logistics, and School of Sustainability students bussing tables and washing dishes. I had also bounced ideas off of Kelly, Alma and Lesley leading up to the wedding, since we are all sustainable event planners. Without the help of our friends and family, our wedding would not have been as fun, beautiful or sustainable as it was, and we are extremely grateful for the help, love and friendship.